Kenneth Grahame, The Wind in the Willows (1908). 5/5. In April this year I took a three-week holiday in Thailand that ended up encompassing a new friendship with a mentor who talked with me about Joseph Campbell, and a terrifying scooter ride up to a town in a mountain valley in which I looked into the heart of fear and found the courage to quit my old life, which in many ways I hated and could no longer bear, to strike out on my own and find a new one. More on that elsewhere. Campbell’s idea is that there is a universal mythic structure, in which the hero hears a call to adventure, accepts it as an alternative to stagnation, finds himself then gifted with mentors and allies, and travels into the darkness to bring back something that revives the world. My real-life hero’s journey impressed me with how vital this story and process remains, and I began to talk about it with numerous people, including my mother, who was reading The Wind in the Willows at the time. My talk of the hero’s journey, she said, corresponded very well with some of Grahame’s famous children’s book, and so it was that I finally got to this, at the age of thirty-two, after never having read it as a child. I do, of course, remember the stop-motion film version (1983) and TV series (1984–1989) by Cosgrove Hall, which played on the ABC in Australia when I was very young. But as with many children’s classics, the book itself holds surprises for the adult reader. Spring was moving in the air above and in the earth below and around him [Mole], penetrating even his dark and lowly little house with its spirit of divine discontent and longing … he suddenly flung down his brush on the floor … and bolted out of the house … Something up above was calling him imperiously … he scraped and scrabbled and scrooged and then he scrooged again and scrabbled and scratched and scraped, working busily with his little paws and muttering to himself, ‘Up we go! Up we go!’ till at last, pop! his snout came into the sunlight. There is further surprise in the enchantment of the chapter “The Piper at the Gates of Dawn,” an otherworldly interlude in which Mole and Rat go looking for Otter’s sun, Portly, and find him on the river, called by the pipes of the demigod Pan, in whose protecting embrace they find Portly nestled. It is an occult, pagan experience that one suspects would sit uneasily with contemporary squeamishness about religious and spiritual matters. Wind in the Willows is, in fact, open to be seen as rife with adult concerns. Mole is the stolid adult who must come to love and be comfortable with his own modest and vaguely boring self; Rat, the poet and boatman, is tempted away from his beloved home on the river by unrealistic visions of a life more adventurous and bohemian than his already is; Toad, more genuinely troubled than I remember from the TV series, seems to struggle with a relatively severe personality disorder involving narcissism and delusions of grandeur, which sees him thrown in jail for stealing and crashing a car. This article as a whole follows a “smear the famous dead” model that I don’t approve of, and reminds me of a documentary I once saw on Bertrand Russell that blamed him for his children’s troubles. Mental illness seems a more likely explanation than parental neglect for Alistair Grahame’s suicide, particularly if Toad is any fair reflection of him. 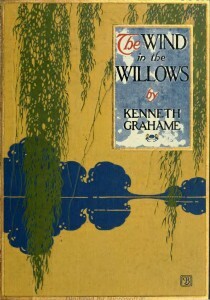 But, knowing from a little reading about Grahame that he was driven early into work instead of study, spent a long career at the Bank of England and worked his way up to being its secretary—while writing only one major work in his lifetime—one may fairly wonder how much parts of The Wind in the Willows express his repressed longings for a different kind of life. Was he able to congratulate himself on being a reliable householder, as Rat and Badger do Mole? Did he suffer from Rat’s temptation to abandon everything for the life of a vagabond, and settle similarly for mere dabbling in literature? Perhaps I could find out, if only… I find myself now, as often, wishing that particular works, in this case Peter Green’s Beyond the Wild Wood: The World of Kenneth Grahame, Author of The Wind in the Willows, were available as ebooks, as I am currently in Bangkok and without a permanent address, living the life of Rat’s alter-ego. In any case, this is an intriguing and classic work, redolent in parts of the hero myth as Campbell lays it out, full of adult significance that child readers will be blind to, and well worth a visit or a revisit by the middle-aged (a category which I am increasingly sure includes myself).